Safeguard your customers’ clothes from spillage with Salonwear’s brand new long sleeve cape and gown. The black gown with sleeves ensures that your customers have a pleasurable spa and salon experience. It is a calf-length, high neck salon apparel with self-gripping closures that ensure that your clients’ clothes are fully covered. This innovative design also protects your customers from any wardrobe mishaps. Apart from our cape and gown, we also have these variants: gowns for salon clients, short sleeved gowns, Euro body wraps, designers salon gowns, cape drape for salon and big shirts pattern robes. We also offer a different type of products: aprons, capes, smocks and coats, vests, designer jackets, spa uniforms and accessories, salon robes, headbands, and wraps. 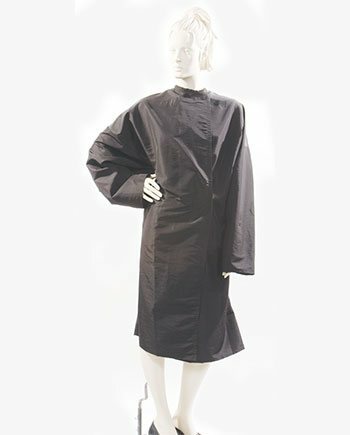 Salonwear’s black long gown is ideal for hair washing, cutting, and coloring, as the fabric used is resistant to water, chemicals and stain spillage. The distinctive design of the long sleeve black gown has the right mix of elegance and functionality. Your customers will feel confident and happy wearing this salon apparel. This in turn will help you build your brand. With so many features, this sleeved cape and gown is available at very reasonable and wholesale prices. This is one product that you must not miss out on! The Salonwear long sleeve black gown is fashioned from iridescent silkara, a polyester and nylon fabric. This fabric is breathable, thus ensuring that your customers feel relaxed during their salon sessions. This iridescent fabric looks not only luxurious but also stylish. At the moment, the long cape and gown salon apparel is available in a classic black color. Dark colors are highly durable and protect your customers from chemical and other stain spills. Salonwear has been the leader in the beauty, salon & spa apparel, and accessories industry in the US for the last 31 years. We are a trustworthy name in this industry and offer only the best quality salon apparel and accessories. Over the years, we have sold a large number of top quality products that ensure repeat buyers. Salonwear is a family business that treats its clients as a part of the family. We have created a large pool of loyal and happy customers.